CM Magazine:Animals at the EDGE: Saving the World's Rarest Creatures. Animals at the EDGE: Saving the World's Rarest Creatures. Jonathan Baillie & Marilyn Baillie. Toronto, ON: Owlkids Books, 2008. 48 pp., pbk. & hc., $9.95 (pbk. ), $19.95 (hc). ISBN 978-1-897349-33-5 (pbk. ), ISBN 978-1-897349-32-8 (hc.). Today, there is a huge mystery about them. Are there any Yangtze River dolphins still living in the river? A recent search failed to find even one. Scientists are hopeful that a few are hiding in the vast and murky river. They are the only representative left from an entire family of mammals. Endangered animals proves to be a topic of interest to all young readers. Animals at the EDGE introduces its audience to some of the rarest creatures that are threatened with extinction and discusses what currently is being done by the EDGE (Evolutionarily Distinct & Globally Endangered) program. This program by the Zoological Society of London focuses on some of the most unusual, threatened species. These strange creatures, unique in how they look and behave, are irreplaceable and are heading to extinction. Unlike other books about endangered animals, Animals at the EDGE provides more than basic information on each animal. It explains to the reader what is being done to promote the survival of these threatened species and introduces firsthand accounts of the scientists and their pursuit of saving the Earth's global diversity. 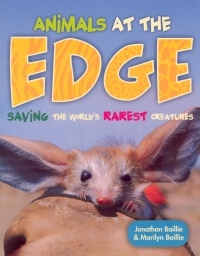 The unusual, almost computer animated creature on the cover of Animals at the EDGE, a long-eared jerboa from Mongolia, is one of 11 fascinating animals featured in the book. Authors Jonathan and Marilyn Baillie present young readers with a simple presentation of evolutionary unique animals at the brink of extinction. The book is formatted to provide a two-page spread on each animal. This layout includes three or four paragraphs that briefly introduce the animal, a first person account entitled 'Meet the Scientist' highlighting the scientific work being done to promote the animal's survival as well as fabulous, colourful photographs, field notes from three scientists and 'Did You Know?' text bubbles with fascinating facts about the animal. The three introductory chapters explain the purpose of the book, modern day extinction and the role of scientists in saving threatened and rare species from destruction. A map showing the location of these 11 rare creatures, a glossary, index and information on the EDGE program are found at the end of the book. Animals at the EDGE provides young readers and researchers with a different take on the topic of endangered animals. Not only are readers introduced to 11 unknown and unusual species, they are also introduced to young, enthusiastic scientists. In the scientists' first person accounts, readers discover what inspires young people to become involved in a scientific program like EDGE. Although the information on each animal is brief and perhaps insufficient for a research project, the EDGE program's website, EDGE of Existence, provides additional facts on each animal as well as hundreds of other species. The colourful design, the weird and fascinating creatures and the human connection between scientist and reader make Animals at the EDGE a great addition to personal and library collections. Janice Foster is a recently retired teacher-librarian who lives in Winnipeg, MB.